Frying up a batch of shoe-string potatoes is so quick and easy (and tasty! ), it’s no wonder that the french fry is a menu staple, all the way from a greasy spoon diner to a Michelin-rated steak house. There are two tricks to making the perfectly crisp fry: soaking and twice-frying. Soaking the cut potatoes prior to frying draws out excess starch, which makes for a lighter texture. Frying the potatoes twice is the secret to getting them to be mouth-watering crisp. 1. Wash and cut potato into 1/4 inch strips. Soak in a large bowl of water for at least 30 minutes, then drain and thoroughly pat dry with a towel. 2. In a deep skillet or saucepan, heat about an inch of vegetable oil to 325F. Working in batches if necessary, fry the potatoes until they are just lightly golden, then remove and allow to drain on a sheet lined with a paper towel. Allow the potatoes to cool for a couple minutes, then fry them a second time until they are nicely golden brown. Remove again from oil to sheet; season with salt and serve immediately. 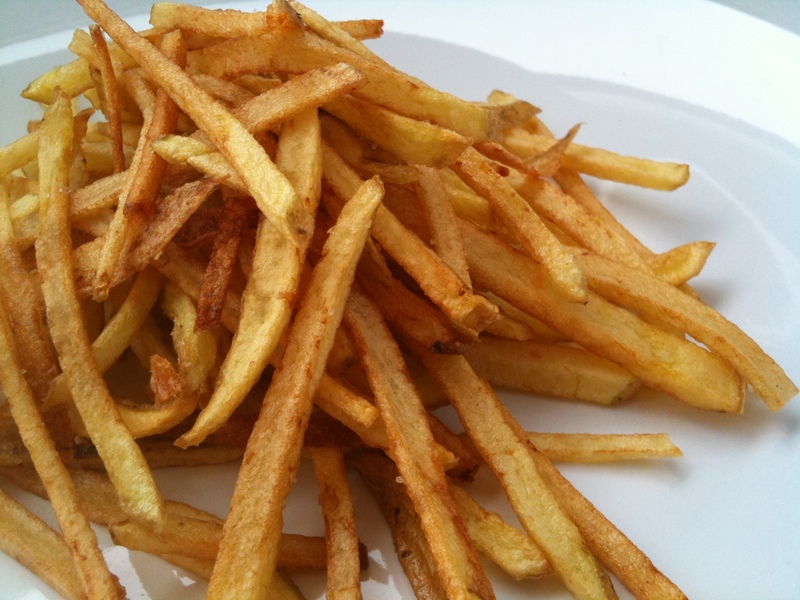 * Cooking times depend on how thick or thin you cut the fries. I like them shoe-string thin; they cook up real fast!